78 W INTER 2019 PracticeLink.com live & practice There are physicians, and then there are Signature Physicians. Join a winning team. 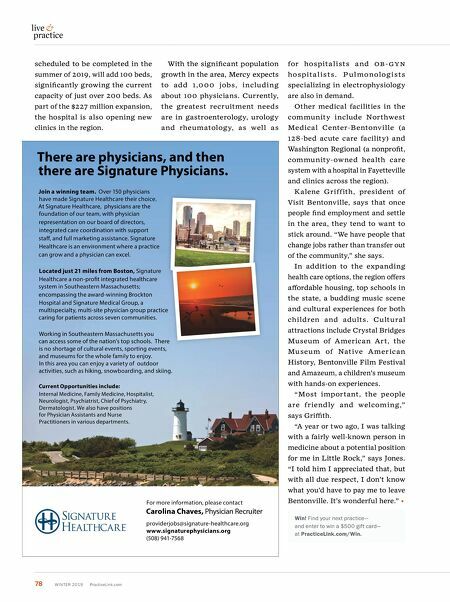 Over 150 physicians have made Signature Healthcare their choice. At Signature Healthcare, physicians are the foundation of our team, with physician representation on our board of directors, integrated care coordination with support staff, and full marketing assistance. Signature Healthcare is an environment where a practice can grow and a physician can excel. Located just 21 miles from Boston, Signature Healthcare a non-profit integrated healthcare system in Southeastern Massachusetts; encompassing the award-winning Brockton Hospital and Signature Medical Group, a multispecialty, multi-site physician group practice caring for patients across seven communities. Working in Southeastern Massachusetts you can access some of the nation's top schools. There is no shortage of cultural events, sporting events, and museums for the whole family to enjoy. In this area you can enjoy a variety of outdoor activities, such as hiking, snowboarding, and skiing. Current Opportunities include: Internal Medicine, Family Medicine, Hospitalist, Neurologist, Psychiatrist, Chief of Psychiatry, Dermatologist. We also have positions for Physician Assistants and Nurse Practitioners in various departments. For more information, please contact Carolina Chaves, Physician Recruiter providerjobs@signature-healthcare.org www.signaturephysicians.org (508) 941-7568 scheduled to be completed in the summer of 2019, will add 100 beds, significantly growing the current capacity of just over 200 beds. As part of the $227 million expansion, the hospital is also opening new clinics in the region. With the significant population growth in the area, Mercy expects to add 1,0 0 0 jobs, i nclud i ng about 100 physicians. Currently, the greatest recruitment needs are in gastroenterology, urology and rheu matolog y, as well as for hospita l ists a nd o B - G Y N ho spit a l i sts. P u l monolog i sts specializing in electrophysiology are also in demand. Other medical facilities in the community include Northwest Medical Center-Bentonville (a 128-bed acute care facility) and Washington Regional (a nonprofit, community-owned health care system with a hospital in Fayetteville and clinics across the region). Kalene Griffith, president of Visit Bentonville, says that once people find employment and settle in the area, they tend to want to stick around. "We have people that change jobs rather than transfer out of the community," she says. In addition to the expanding health care options, the region offers affordable housing, top schools in the state, a budding music scene and cultural experiences for both ch ild ren a nd adu lts. Cu ltu ra l attractions include Crystal Bridges Museum of A merican A rt, the Museu m of Native A mer ica n History, Bentonville Film Festival and Amazeum, a children's museum with hands-on experiences. "Most important, the people a re friend ly a nd welcom i ng," says Griffith. "A year or two ago, I was talking with a fairly well-known person in medicine about a potential position for me in Little Rock," says Jones. "I told him I appreciated that, but with all due respect, I don't know what you'd have to pay me to leave Bentonville. It's wonderful here." Win! 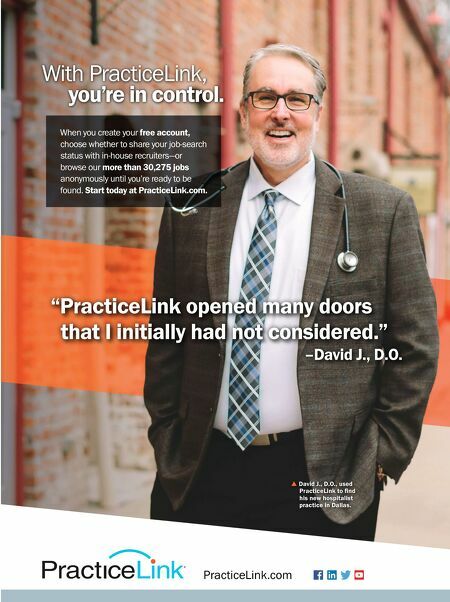 Find your next practice— and enter to win a $500 gift card— at PracticeLink.com/Win.